Music, Arts, Crafts, Recipes and Fashion blogging from a Gothic/Dark Romantic perspective. My personal blog as a 'grown-up' Goth and Romantic living in the Highlands of Scotland. I write about the places I go, the things I see and my thoughts on life as a Goth and the subculture, and things in the broader realm of the Gothic and darkly Romantic. Sometimes I write about music I like and sometimes I review things. This blog often includes architectural photography, graveyards and other images from the darker side of life. Goth is not just about imitating each other, it is a creative movement and subculture that grew out of post-punk and is based on seeing beauty in the dark places of the world, the expression of that in Goth rock. It looks back to the various ways throughout history in which people have confronted and explored the macabre, the dark and the taboo, and as such I'm going to post about more than the just the standards of the subculture (Siouxsie, Sisters of Mercy, Bauhaus, et al) and look at things by people who might not consider themselves anything to do with the subculture, but have eyes for the dark places. The Gothic should not be limited by what is already within it; inspiration comes from all places, the key is to look with open eyes, listen carefully and think with an open mind..
As I have mentioned before, this year I will be blogging about the Neo-Pagan festivals of the eight points of the 'Wheel of the Year', celebrations shared by Wiccans, Druids, and some other Neo-Pagan paths, based off four solar festivals which, being based on celestial events, are common celebrations many cultures (the two solstices and two equinoxes), and the four 'fire festivals' or 'cross quarters', which are tied to folk festivals of Britain and western Europe. The Vernal Equinox is when day and night are equal, in spring. Many Neo-Pagans celebrate it as 'Ostara', named after a celebration mentioned by the chronicler 'the venerable Bede', and which may be named after a Germanic dawn goddess, and which is likely the root-word for 'Easter' in English (most other languages have a name deriving from 'Pascha'). I just celebrate it as the Vernal Equinox. I think I do the Equinox a bit differently from many Neo-Pagans as I don't incorporate rabbits, hens and eggs. Neo-Pagans now regard these as fertility symbols, and I think that's a very valid perspective, but their association with Easter had more to do with which food were restricted during Lent - meat was forbidden, as were eggs and dairy (Thomas Aquinas wrote against consuming these), and so of course once the fast was broken on Easter, people wanted to consume them. Lambs are very much an important Christian symbol, with Jesus as the Lamb of God, and I can't help but think of the rather beautiful Pre-Raphaelite inspired mural that graced a church I used to go to of the adoration of the lamb when I see lambs in a religious context. My rejection of these symbols because of their Christian (and particularly Catholic) associations is not a protestation against Christianity or an act of my disliking Christianity, more that I wish to separate my current faith from my old faith, and I feel awkward doing things that remind me too much of Christianity; I feel like I'm misappropriating, or somehow trying to Paganise things, which may or may not be a valid concern or just a manifestation of my anxiety and over-thinking. Instead of these animal symbols, I prefer floral ones - picking what is in bloom in my garden at the time. I don't rear chickens, rabbits or sheep, so it seems a bit disconnected for me to celebrate lambing (which is often quite a bit before Easter in the UK, anyway), or their lifecycle in relation to the agricultural year. The birds nesting in my garden are more seasonally appropriate to me than chickens. [Interestingly, chickens need about 12 hours of daylight to signal the summer period for laying eggs - so the Equinox is actually directly relevant to chickens. Some will lay in winter even without an appropriate light source, but egg production goes up with daylight hours. I do, however, grow flowers (and vegetables, herbs, etc.) so I feel more personally connected to flowers. You can see on my altar a bunch of hyacinths and daffodils in the centre. 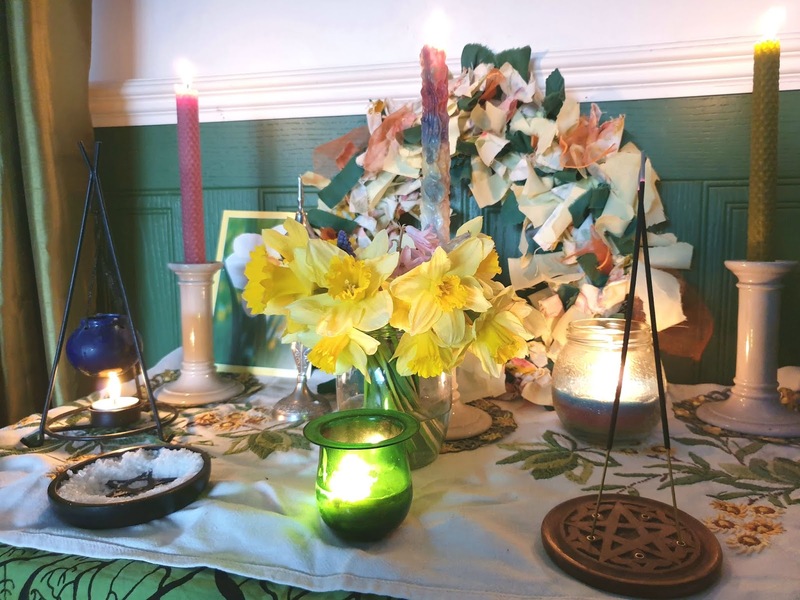 I changed my altar set-up from its Imbolc set up to this pre-Equinox set up at the start of March, and it is definitely geared more to a visual celebration of the changing seasons and the greenery and flowers of spring. Daffodils and hyacinths are both poisonous to cats, but this set-up was before Archimedes arrived, and was dismantled before Archimedes left his acclimatisation period in the spare room, with any pollen hoovered up. I have two altar cloths again, layered over each other. The bottom altar cloth is a printed light green one with a leafless tree, an image that makes me think of a tree about to spring into life, rather than a dead tree. The upper altar cloth is actually a vintage table-runner I bought on eBay because it reminded me of my grandmother's handicrafts. She used to make things very similar to this, and as the item seems entirely handmade, I can picture someone else's grandmother making this the same way. I wish I had inherited some of my grandmother's embroidery, but I was a child when she passed, and did not end up with anything like that. I found some daffodil doilies secondhand that I tend to use for tea-parties, but I put one under each of the candle-holders to protect the altar cloth from any wax drips that ran off the candle-holders, because it is an old and fragile embroidery, sold to me as being from the '50s, and I don't want to damage it. The embroidered flowers are somewhat stylised, but they remind me of marigolds, which are currently flowering in my garden. Daffodil doilies to protect vintage altar cloth. The wreath at the back is a hand-made house decoration some students at my college were selling as a charity fundraiser. 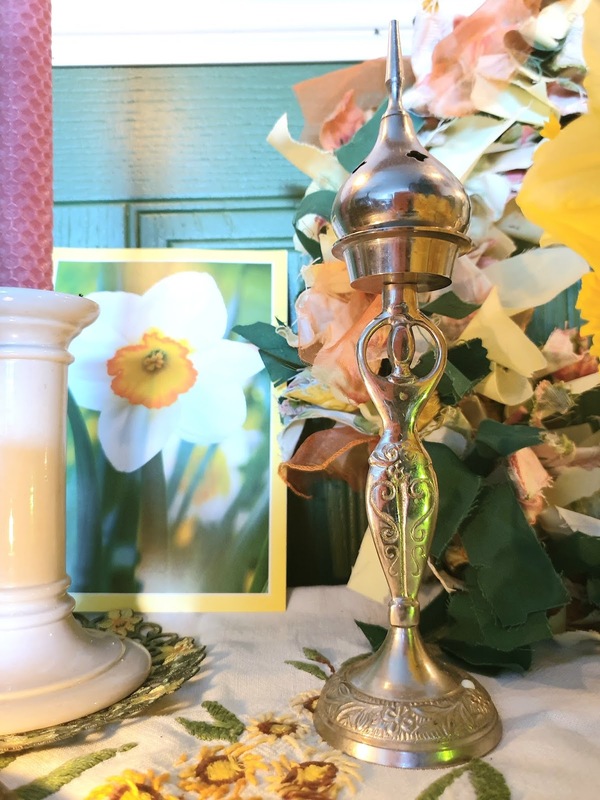 It has lovely spring colours, so I use it as an altar decoration each year. I really like using circular symbols for solar festivals, simultaneously representing the sun and the cycle of the seasons. I don't have space on my altar for both the pentagram candle-holder and the wreath, so the pentagram candle holder has been moved to in front of our fireplace. 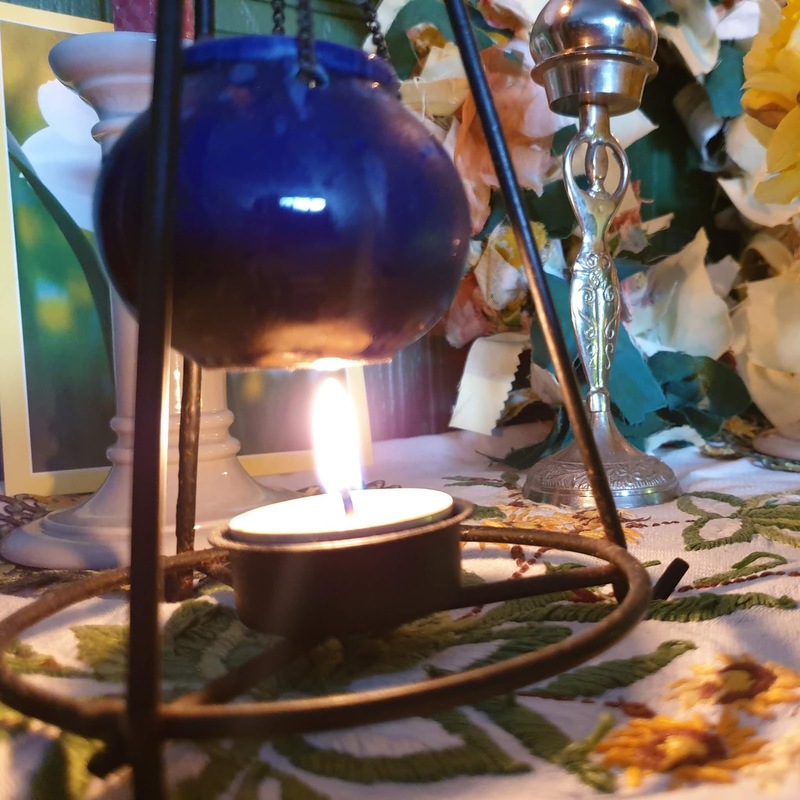 To represent the elements, there is a jar candle on the altar; it has five layers in different colours, made from the melted down stubs of past elemental candles used on our altar. 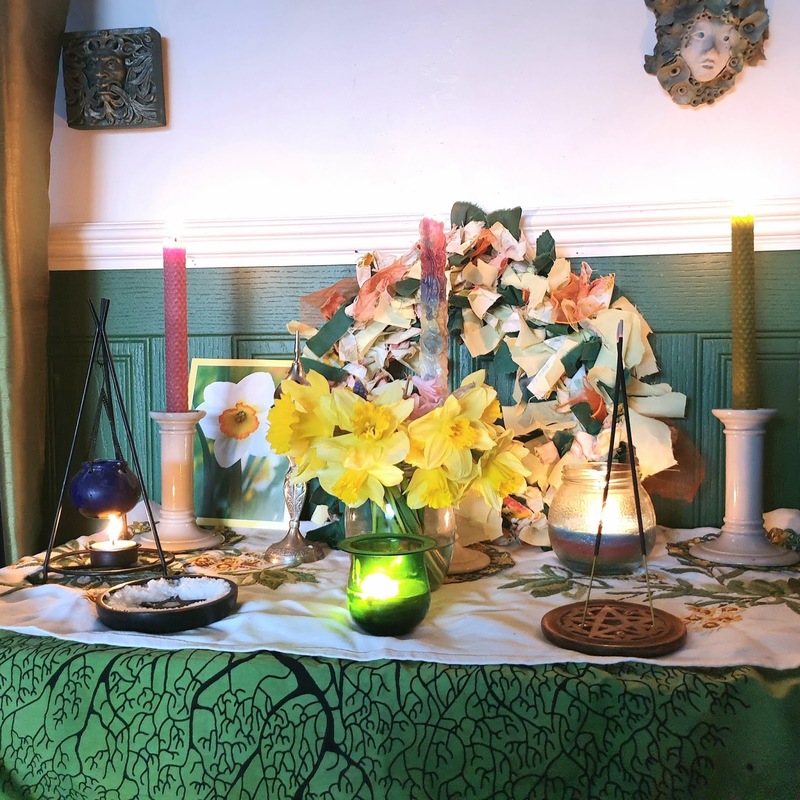 The left side of the altar is used primarily for the symbols traditionally associated with the Goddess in Wicca once again as with my ::Imbolc altar::, but this isn't a strict attribution. Incense is used to symbolise the element of Air (and to be burnt as an offering, and to create a ritualistic atmosphere through scent), and many traditions see Air as a masculine element, associated with 'masculine' attributes, but I don't see the point in gendering an element, or even more so of gendering characteristics like logic, clarity of thought, communication, etc. I have an incense holder with a Neo-Pagan style Goddess figure holding up the incense censer, but that does not mean I see the element of air as feminine, either; I just like the figure as a sculpture representing the divine feminine, and it happens to also be a perfectly good censer at the same time - I have another incense burner that is a pentacle (visible in the photographs of the full altar). I think it's probably a bit cliché to attribute pink to the divine feminine - especially as a girl that hated the colour pink growing up - but I chose it to represent Bloduweudd, who was made of flowers, specifically oak, broom and meadowsweet.. Now, I somehow thought oak flowers were light pink, which I am quite wrong about; they're a greenish yellow. Broom flowers are yellow, and meadowsweet flowers are white, so I would have probably done better with a pale yellow candle, in retrospect! The daffodil picture is not a Goddess symbol at all, it is actually a card I gave Raven for St. David's Day - the saint day for the welsh patron saint, who is St. Dewi in Welsh. St. David's Day is seen more as a national celebration than as a Celtic Saint's day by many, including Raven. I have mentioned before that he is Welsh-Irish. 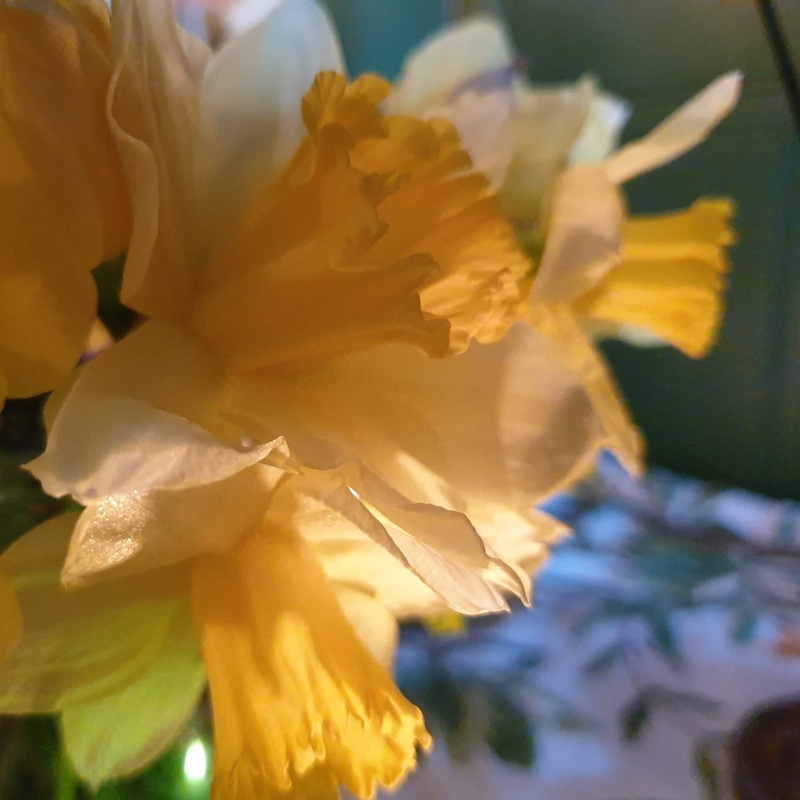 Daffodils are Wales' national flower; the national plant symbol is a leek, and daffodils are 'cennin Pedr' or Peter's leeks in Welsh, which is presumably where the connection comes in between the two plants. Anyway, the card was placed on the altar as another mark of the passing seasons, and a nod to Raven's Welshness. I have a light green candle to represent the Green Man, a vegetative spirit (or even deity to some) that I associate with the changing seasons as visible through plant life. New spring leaves are slowly emerging, light and vibrant, not yet darkened to the richness of summer. I light the pink candle when invoking the divine feminine, and light the green candle when invoking the divine masculine. The central, multicolour candle is represented of the divine as simultaneously transcendent of material existence and immanent within it. I am a pantheist that sees individual deities as spiritual aspects or manifestations of the greater divine that is in all things, and that candle made of all colours seems like a good representation of that. It is a lovely hand-made textured candle, but I can't remember where I bought it. I think it might be from 'The Maker's Mark' in Newcastle Emlyn, but it could be even older - a souvenir from a lovely witchy shop I found behind a record shop in Henley on Thames over a decade ago. I have kept it safe in my wicker basket store of candles for a long time, but felt like this is the right time to burn some of it. I must admit I'm sort of clingy about candles, and don't like burning the prettiest ones, especially all in one go - I want to stretch it out so I can appreciate them for longer! Quite silly when candles are intrinsically transient, made to be burnt. Perhaps I'm a sentimental fool. The blue cauldron hanging over a flame is Raven's. It's meant as an oil-burner, but as many oils are toxic to cats, we are no longer using the oil burners for their true purpose. However, watching the water evaporate off as misty vapour is rather aesthetic, so I am still putting water in them. We will need to look further into what oils can and can't be used around cats, as we don't want to poison Archimedes. I chose this blue cauldron to represent the element of water on my altar. It's purpose is more symbolic than practical for my Equinox ritual, unlike the bigger copper cauldron I used as a temporary planter, and as a receptacle for any drips after I watered my snowdrops from the Well of the Spotted rock for Imbolc. Marigold and salt in pentacle dish. I have a carved stone dish for salt, to represent the element of Earth. It is interesting that salt is what we use when 'salting the earth' is something done to make it infertile. Salt is sometimes used for drawing a circle on the floor, but I think that's a waste of good salt. I am thinking of replacing the salt-as-Earth-representation with sand, fine gravel or soil. 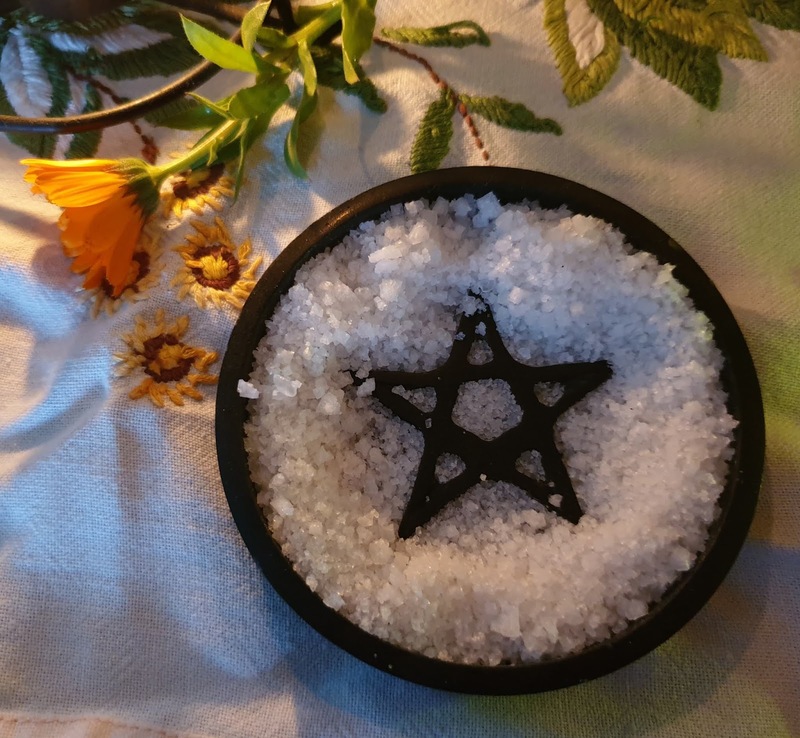 Salt as ritual ingredient is still useful, but I associate it more with sea-salt (I know rock-salt exists) and the ocean, and I want to change things around that I no longer connect with. Neo-Paganism is -in general - quite a flexible path, and while we practice similar things, there is room to alter things in accordance with what works best for us. We're a non-dogmatic religion, with each Pagan being their own Priest or Priestess. 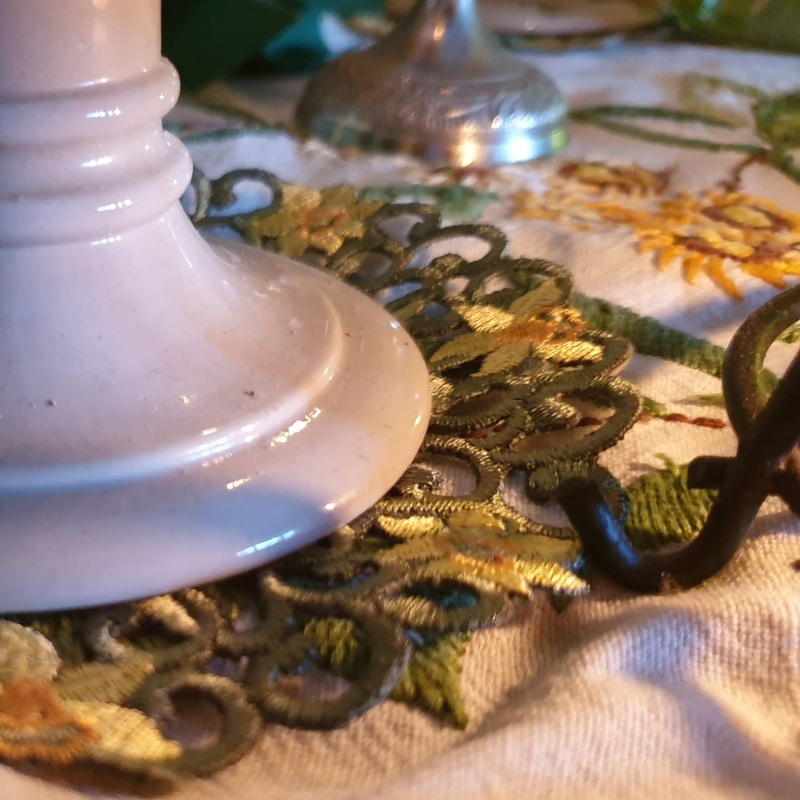 We tend to be closer to orthopraxic ('right practice') than orthodoxic ('right doctrine') in that we are more connected by ritual practice than theology or cosmology, but even within ritual practice there is plenty of scope for variation. I hope this blog entry has been useful and informative as an example of one Pagan witch's practice. There's a lot more I could say about each thing, but I think I am rambling on quite a bit already. As I have said before - I'm just one person, and I will do things differently to other witches and other Pagans, but I don't consider myself much of an outlier in terms of my practices. I am doing this to counter some of the stereotypes about Neo-Paganism and witchcraft - especially those about it being a dark or evil practice. Most of what I do is making a ritual of ways to connect to the natural world and changing seasons; mine is definitely an Earth-based spirituality. My regular readers might be surprised at the colours - especially green wall paneling in my ritual space, and plenty of yellow and pastels for this seasonal celebration, but I don't think my religious practice necessarily has to reflect my Gothic aesthetic - some of it does, especially my work with the Morrigan and Her aspect as Badb, and with the Cailleach of winter - and these are things you will see on my Samhuinn altar and my altar in the 'Dead Time' between Samhuinn and Winter Solstice, but for the rest of the year, the colours reflect the seasons more than they reflect me - after all, my spiritual practice is more there to connect me better with nature, rather than for me to express my personal style or aesthetic. I have long felt that it's important to utilize symbols that have meaning to oneself. As an example, there are many, including some Native American tribes, that believe the hooting of an owl portends that something sinister is going to occur. I have noticed that many people cling to that belief. There are times though, that I walk out my door, hear an owl, and take something entirely different from the experience. Humans, in general, tend to enjoy dogma. Someone has a particular experience, and before you know it, that person's take on it has become a religion, as if every one else must cling to that one occurrence as fact. It's my belief that every experience we have with Nature is personal, and not necessarily appropriate for anyone else. I suspect that your perspective is similar. In Welsh mythology, Blodeuwedd was turned into an owl after being persuaded into a conspiracy to kill her husband (it's a strange story). I am quite unnerved by the banshee shriek of a barn owl, but a hooting tawny owl is exciting because they're cute. My perspective is indeed similar; I feel like people should cultivate their own relationships with nature and the Divine, but I understand that for many people, using someone else's template can be helpful - heck, I very much started vout on my path as adhering to practices and beliefs as set out in certain books, and I still carry some of those ideas forwards, but I also know I can tweak things to whwst suits me. I agree with you about Neo-Pagan being varied... 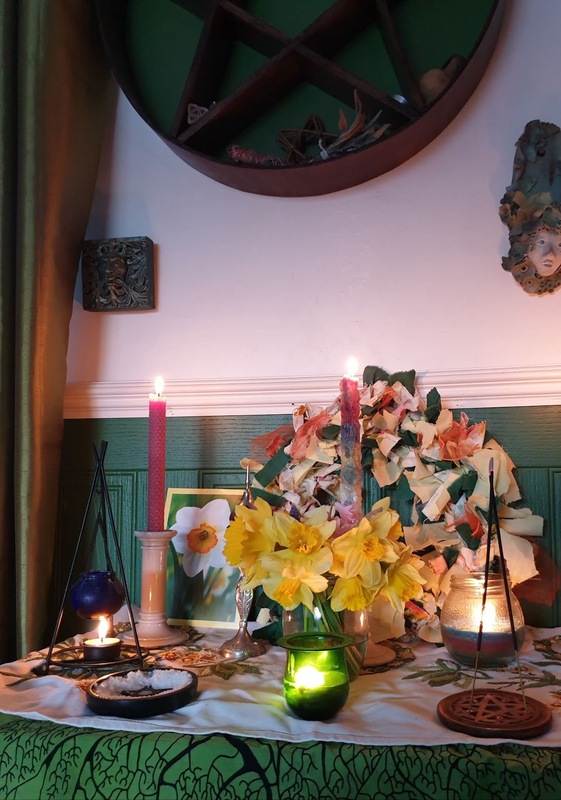 I personally have found that the way I set up my Altar and the way I practice has been quite different from many other Neo-Pagans that I have met. In particular the way I label myself, although I am technically what would be called Neo-Pagan, I dislike being called that (mainly because I am so Eclectic in my practices, I take things from Pagan, Wiccan, Shamanic, Germanic, Egyptian and Norse faiths and folklore and use what works for me) and often just refer to myself as just plain 'Pagan' as I find this less confusing for others when I try to explain my faith and my lifestyle. I have definitely seen the differences (as well, as the similarities) between the way each of us do things within our own local Moot Group. But I find this all the more interesting and intreguing and love how dinamic we are as a collective..... I DO adorn my Ostara Altar with Rabbits, and coloured Eggs (coloured using food dyes) as well as the seasonal flowers, but for me this is less to do with my Christian past and more to do with my German Upbringing... My German family always celebrated Easter with lots of colour, Little Wooden Rabbit figurines (of which, have been handed down to me over the years) and hand dyed egg shells (the egg inside, removed by making two pin prick holes one in the top and one in the bottom of the shell and then Blowing the raw egg out through these holes), as well as home made biscuits (much like the Scottish short bread)....and I like to keep this tradition within my witchcraft... Basically anything that connects me to my German heritage, I love to incorporate if I can, when I can. I use Neo-Pagan because Wicca and Druidry are both more recently established practices. Druidry is much older, with 18thC beginnings, although many of the early 'Druids' were Christian, and there was a split between cultural Druids such a those who are part of the Eisteddfod movement, and those who became today's religious druids. What the original Druids actually did is pretty much lost to history as we can't trust the Roman accounts, and they didn't write down their religious practices as it is thought that part of their sacredness was that they were keepers of secret knowledge passed down orally and committed to rote memory. Other ancient Pagan practices, especially Hellenic, Roman and Egyptian, had a lot more written down about their practices, and while the animal sacrifices haven't been revived, there are plenty of ways of worship that can be practiced today, down to prayers and invocations, that were used in the past, as well as ancient texts on Classical theology, at least. Theirs is reconstructionist paganism, and while certainly in a newer format, not really a new religion. Norse is I think a bit of both; there are sources on what they did, and there's certainly sources for early modern magical practices in Scandinavia, and plenty of poetical/mythological works, but I think there has also been quite a bit added to the contemporary practice in modern times; part reconstructionist, part Neo-Pagan. If you're blending both reconstructionist and Neo-Pagan practices together, then Pagan will probably do best to convey what it is you do (although I think there are sociologists who would disagree, and use 'Pagan' for ancient religion only, and 'Neo-Pagan for anyone modern practicing ancient religion, and maybe 'New Religious Movement' for things like Wicca... semantics differ in context). The Open Circle's moots are great - and there's indeed so much variety in practice. We've got Heathens, Wiccans, Chaos Magicians, and me the Celtic Witch, all sorts! It's been wonderful meeting new people through the group and compare and contrast on what we all do. Hand dyeing eggs is a fragile art! I tried once as a school thing and just mullered my egg! I like how you're incorporating your heritage so personally into your practice, and it's nice that you actually have family traditions that can be worked in. As I mentioned with the altar-cloth, there's very little I have from my family, for reasons we've discussed in person. I think the combined practices of Raven and I certainly lean towards Celtic practices because that is our heritage, but while he is Welsh-Irish and grew up with those cultures, I am disconnected from my Breton-French heritage due to the unfortunate family circumstances of my youth, so I feel more like the second generation immigrant that is trying to reconnect to their diaspora roots rather than someone passing on a family tradition. Please be polite and respectful. Comments containing gratuitous swearing and insults will be deleted. I am an adult Goth who was always a bit... different and has grown into the subculture rather than out of it. I am currently studying Architectural Technology as a mature student, and also work as a freelance artist and illustrator. I've lived in Scotland for the past 5 years, and now have my own home, which slowly becoming my Gothic lair, which I share with my partner, Raven.